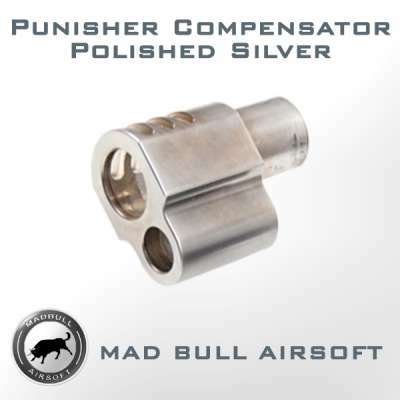 Madbull Punisher Style Compensator for Socom Gear / WE 1911 (Silver). Now available from Madbull is the Punisher Style Compensator for 1911 series pistols in a Matte Black or a Polished Silver finish. Originally featured in "The Punisher" on two classic Colt 1911s. Compensator are generally used to redirect propellant gases which effectively counters both recoil and unwanted barrel rise. 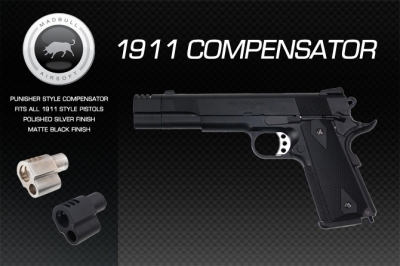 Compensator are very useful for both combat and competition shooting scenarios.